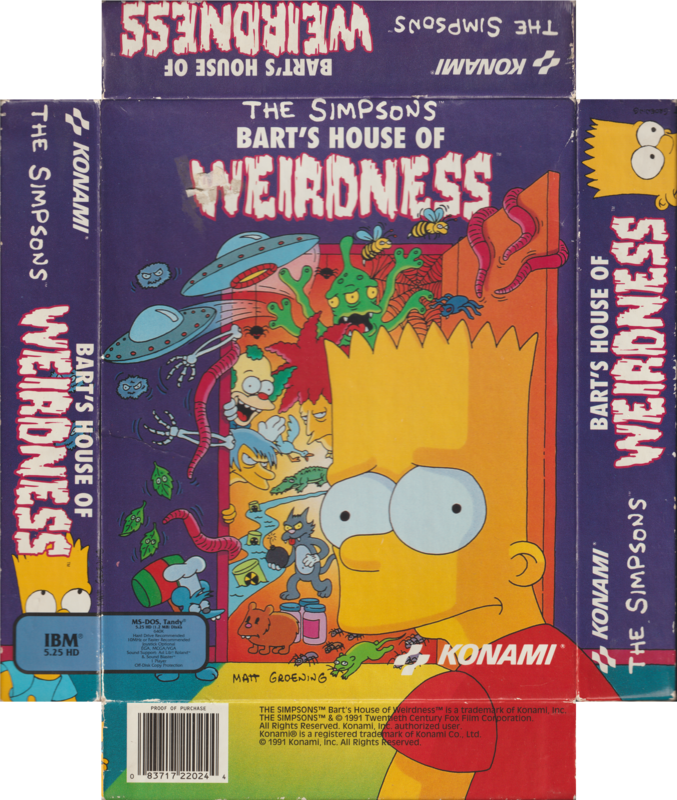 Released in 1992 by Konami, and developed by Distinctive Software. 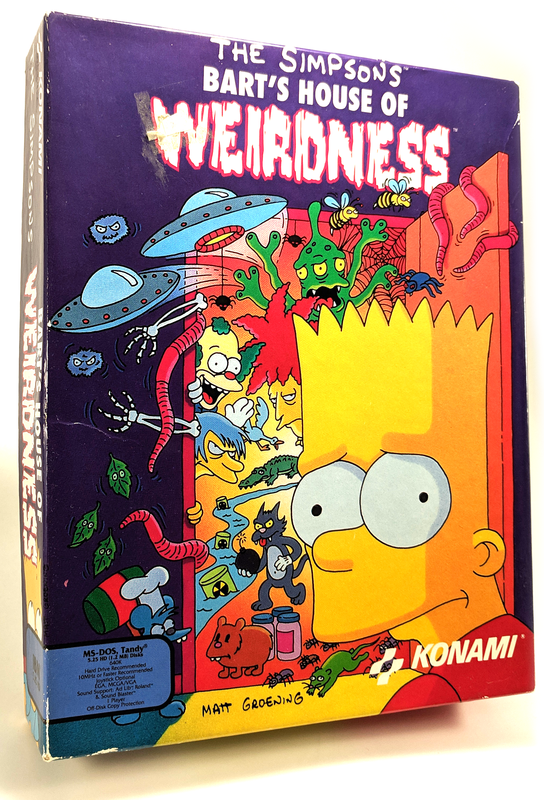 opposed to the variety of other Simpsons games. thereby regaling himself to the status of World Savior. Bart gets sent to his room and he lets his imagination run wild. keys to scroll through the pictures. Below is each set of numbers and which picture is the match. Bart walking left, legs wide apart. 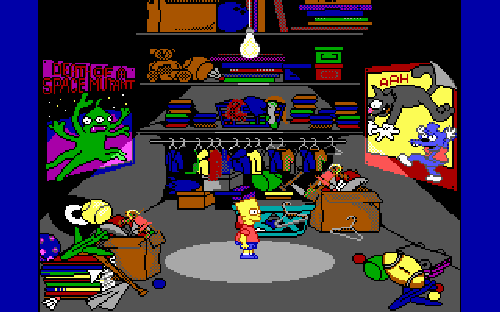 Bart standing still and facing right. 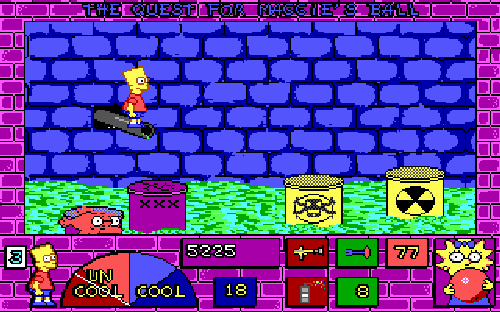 Bart with a spray can facing right. Bart walking left, legs close together. 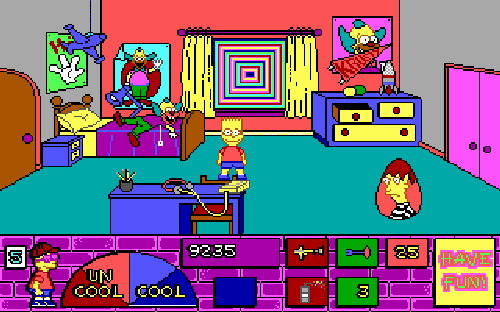 Bart facing the screen, right arm in front. 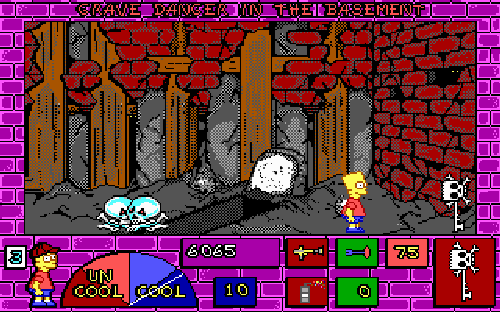 Bart with a slingshot facing right. Bart jumping right, arms up and legs up. Bart jumping right, arms down and legs down. 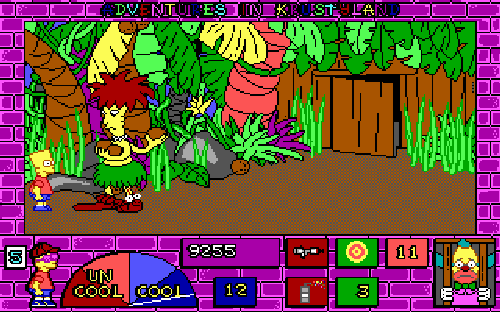 Bart pointing a gun left. Bart pointing a gun right. Bart jumping right, arms down and legs up. Bart with a water balloon, facing left. start with three, and the game ends when you have zero. record purposes. You are ranked based on the number of points. indicates which screen you are in. right are the type of ammo and number of remaining shots. right is the number of remaining shots. music, SFX, game difficulty, or quit. Esc            |  Go back to Bart's room. Quit game. There also objective items, but they are pointed out in each stage. Press Enter next to the Krusty doll to read different Krusty comments. keys to choose between the different songs. don't worry. You won't lose health or lives. your game, the closed drawer is to load your saved game. Krustyland', but only after you have beaten the other six stages. Secret of the Attic' stages. points you got in the stage. damage. Those are the only differences. Objective: Find five coins to watch a movie at the theatre. coin, and easily avoid the mosquitoes. mosquitoes. You will also find some burp balls to the left. balls, then come back to 03. Repeat this to get 99 shots. Now climb up the gate to Burns' Estate. dog, then carefully jump over the second. After you've passed them, try to get the burp balls for more ammo. (sometimes he'll still hit you), or by shooting his head four times. Anyway, grab the donut for some health then stand to the far left. you run the risk of getting hit more times by Smithers. use water balloons. Burns won't attack you. Just jump over these dogs and run. Shoot the goose to scare it off, then grab the spray can if you like. Jump on the log, then jump left to get back to the street. Avoid the ants and mosquitoes as best as you can and go left. Avoid all the bugs and go left. now just avoid all the bugs and go left. Avoid the bugs yet again and enter the mall. Avoid the guard or shoot him, then grab the coin. Once again, avoid the guard or shoot him, then go left. Avoid the guard and the dog. You won't need the burp balls. Shoot or avoid this guard, then grab the fifth coin! Go to the right to EXIT. Avoid everything and go right. ticket and finally watch the movie. needed to beat the game. Walk straight right, through the bees. You will only get hit once. limb to the other to keep going. the right, then jump. You will catch the ties just as they approach. Now grab the darts and move on. the leaves, they only attack when the eyes are open. Don't worry about the water balloons, you won't need them. bother with the bees or bee hive. are plenty of donuts later on. the other two items and the bees. Ignore the squirrel and fall straight down. Avoid the worms or use spray paint because they take a lot of health. Avoid the ant too and keep going right. the spray can if you need it. health and you will start back at Screen 17. So, go to the right. 18 to keep getting donuts and refilling your health. Avoid the fish again, then jump your way across the yellow barrels. Remember that the purple barrel won't sink. Objective: Get the skeleton key. box for a spray can. balls, but try to get hit only once. want to keep the spray cans. and just run. You may get hit once, but it's no big deal. for a slingshot, so if you have one grab it. away and leave a spray can. hit by something, but try to get hit only ONCE. when the earthworm is not blocking the left side. go, then press them again to kill the other skeleton. directly under the tombstone. Jump over the next hole and keep going. the open grave to reach the skeleton key and beat the stage. Objective: Get the gold key. Just run through the two bees and ignore the burp balls and darts. hit again, but only once. pillows and jump to the left until you're on the stack of newspapers. onto the boxes and jump up. just fall or get hit. touch the left side of the screen, or you will fall back to Screen 04.
other side. Mind the nails. to you if you want to try. the spray can. You should have plenty of spray cans from earlier. need them all to defeat the giant spider up ahead. donut. Grab it if you're REALLY low on health. Just run straight to the right, avoiding the bees and little spiders. You'll get the spray can along the way, if you need it. health. Forget about getting the extra life. paint every time an egg flies out. Objective: Find the cook book. gun. This gun is specially made to kill space mutants. health than the train mutant, so it's a small sacrifice. appears, then shoot the gray box on the right to get some spray cans. Jump over the sewer hole. donut and go to the left. If you have the Cool Hat, the robot's lasers won't cause any damage. So, shoot the space mutant then use your spray can to kill the robot. Shoot the other space mutant and grab the ammo. kill the space mutant, then get the ammo. until you get 99 ammo. to kill the space mutant. Grab the spray cans if you can. Kill the three space mutants and keep going. obviously shouldn't need it by now. Shoot the two space mutants and the robot, all with your mutant gun. You do have plenty of ammo after all. Keep going left. Objective: Escape from Itchy and Scratchy. to memorize what is on each screen and the best way to avoid it. any red bombs and avoid as much as you can. sure your health is full before going on. for the bombs to fall then immediately run for it. walking across the counter. Make sure to get the extra life. Run past Scratchy and just run! Look out for Itchy's arms. and Scratchy to finish the stage. Objective: Save Krusty the Clown! Jump across the logs and get the large burp ball on the other side. on that rocky spot to get the big burp ball. open. Jump to the right. the next one and jump to the right. rocky area, and keep going. After you get the fourth one, fall to the left. After getting them all fall straight down. Get the one big burp ball here to have a grand total of 13 burp balls. can't beat the stage with less than 13. Go to the right if you're set. Don't shoot the centipede, just jump over and keep going. does cause a lot of damage. falls walk to the right. extra life and save Krusty. skateboard next to your name as proof that you beat the game. 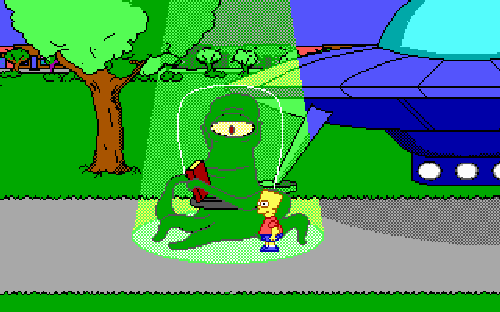 Thanks for playing another great Simpsons game! There aren't any codes, just a couple of little secrets. will be also be lost. 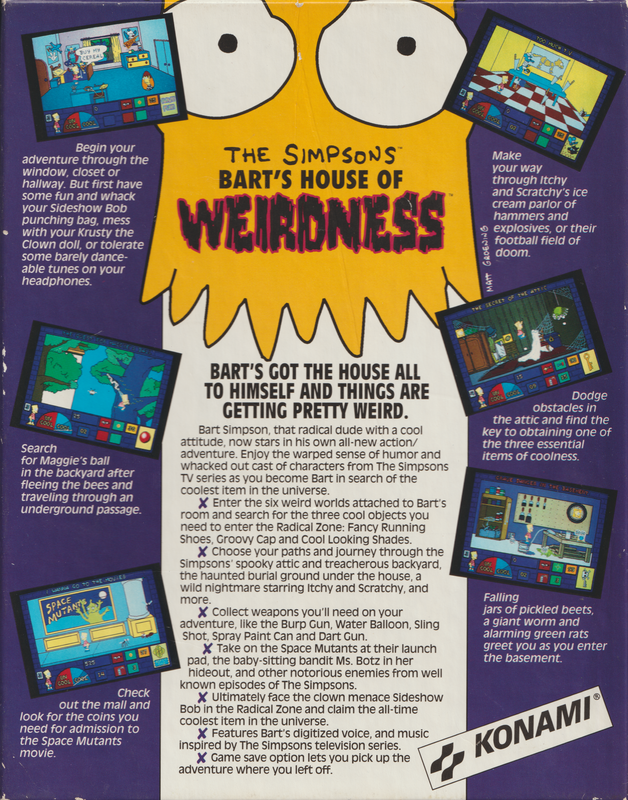 Simpsons Arcade that game developers used the sitcom for ideas. 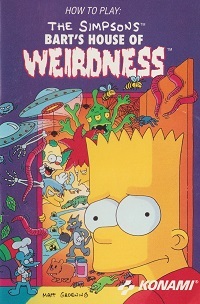 famous space mutants of the Simpsons early years. Updated the controls and added some new secrets. Just another rewrite, which sends this FAQ back to 1.0. 4. Konami and Distinctive Software for creating the game.